Our view of the world today is fundamentally influenced by twentieth century results in physics and mathematics. Here, three members of the French Academy of Sciences: Alain Connes, Andre Lichnerowicz, and Marcel Paul Schutzenberger, discuss the relations among mathematics, physics and philosophy, and other sciences.Written in the form of conversations among three brilliant scientists and deep thinkers, the book touches on, among others, the following questions: Is there a 'primordial truth' that exists beyond the realm of what is provable? More generally, is there a distinction between what is true in mathematics and what is provable? How is mathematics different from other sciences? How is it the same? Does mathematics have an 'object' or an 'object of study', the way physics, chemistry and biology do?Mathematics is a lens, through which we view the world. Connes, Lichnerowicz, and Schutzenberger examine that lens, to understand how it affects what we do see, but also to understand how it limits what we can see. How does a well-informed mathematician view fundamental topics of physics, such as: quantum mechanics, general relativity, quantum gravity, grand unification, and string theory? What are the relations between computational complexity and the laws of physics? Can pure thought alone lead physicists to the right theories, or must experimental data be the driving force? How should we compare Heisenberg's arrival at matrix mechanics from spectral data to Einstein's arrival at general relativity through his thought experiments?The conversations are sprinkled with stories and quotes from outstanding scientists, which enliven the discourse. The book will make you think again about things that you once thought were quite familiar. 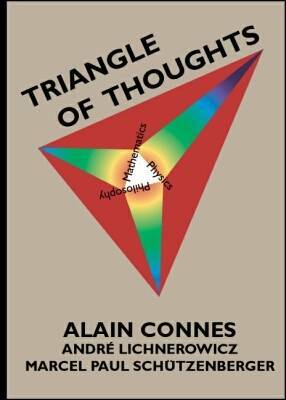 Alain Connes is one of the founders of non-commutative geometry. He holds the Chair of Analysis and Geometry at the College de France. He was awarded the Fields Medal in 1982. In 2001, he was awarded the Crafoord Prize by The Royal Swedish Academy of Sciences. Andre Lichnerowicz, mathematician, noted geometer, theoretical physicist, and specialist in general relativity, was a professor at the College de France. Marcel Paul Schutzenberger made brilliant contributions to combinatorics and graph theory. He was simultaneously a medical doctor, a biologist, a psychiatrist, a linguist, and an algebraist.